Nowhere is it more obvious that Highlander is immortal than in Hollywood. The town has been trying to remake the film for the better part of a decade and the thing just won’t die. In that time, multiple directors have worked on the property and the fact nothing has come of it suggests it’s not the easiest nut to crack. The latest director is John Wick helmer Chad Stahelski and, in a new interview, he explained a bit of why the remake is taking so long. It comes down to this: there’s just a lot of material. 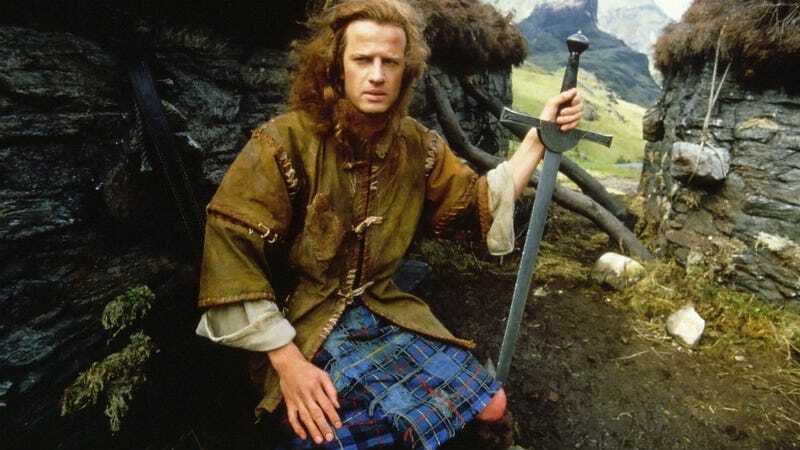 Highlander isn’t just the cult-beloved 1986 film. There were four sequels, a live-action TV show, animated show, and more. Most of it isn’t that memorable but Stahelski has become obsessed with the mythology and is trying to make his film an amalgamation of all the best stuff from everything in the franchise. I think the TV series hit on a lot of great stuff wasn’t in the feature, between the watchers and all the different types of immortals. How do we get this into a feature mode before we dribble it into the TV world? Well, let’s restructure it in parts, let’s look at it like it was a TV show, let’s look at it like it was a high-end trilogy. How to we tell the story of The Gathering, The Quickenings, The Immortals and how do we really build this world out even more so than the original project? That’s what we’re restructuring right now. It’s taking all the good stuff that we had before I was involved in the project from the script; redeveloping the script to give us really good chapters one, two and three; and expanding the world. Yes, you read that right, they’re planning it as more than one film. That’s not always a good thing but, the model they’re using worked. The vision we’re trying to get across and what we’re trying to develop, I equate very close to Star Wars. The first one us a very satisfying ending but it does leave the door open and that’s kind of how I see this. I would really like to expand it over three. I see The Gathering happening over three. It’s tricky, don’t get me wrong, that’s why we’re still developing it. We want to be able to tell three complete stories that all kind of fit. I think the Star Wars trilogy, at least up to The Empire Strikes Back, is a good example of how we want to process it. Let’s ignore that Return of the Jedi dig and move along. If you’re looking for a reason to be optimistic about the delay, this is it. The fact that Stahelski and his team are using all the resources available to them and trying to tell a new version of this story, doused with mythology, is a noble thought. Hypothetically, it could reinvigorate the franchise in a way that’s familiar to fans, but also new and exciting to general audiences. Whether or not they’ll be successful and come up with a single script to do that is a whole other thing. Hence the delay. What we do know, though, is if Stahelski gets to make his version of Highlander, it’ll have at least one crucial thing in common with the original. The tone of the first one just hit at that weird music video edge in the 80s that had Queen and for some reason, Queen just fits. I don’t think you can do Highlander and bring about that kind of tone again with the mythological world and take it too seriously. Just as we did with Wick, you can’t kill 80 people over a puppy and take yourself seriously. We got to let the audience know that we’re having fun and that there is a world here. Point being I can’t see Highlander without Queen, without the queen center, without having Freddy Mercury, “Prince of the Universe,” and all this stuff. I can’t picture the movie in my head without it. The director is certainly saying all the right things. Read more from the interview at the below link.